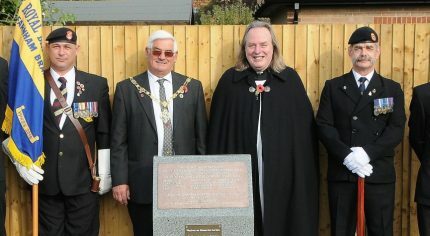 The Weybourne war memorial has been rededicated in a new memorial garden following completion of work to improve the tribute to local people who died during the first and second world wars. The main memorial plaque lists 12 people who died during the second world war and is now proudly mounted on a new marble memorial. A memorial garden has also been designed and created for reflection and quiet contemplation. The rededication service was presided over by Reverend Alan Crawley from the Parish of Badshot Lea and Hale. He was joined by the Mayor of Farnham, members of the Royal British Legion, 4th Battalion Prince of Wales Royal Regiment, Weybourne Hall Committee members, pupils from local schools and people who worked on supporting the project to ensure it was completed in time for Remembrance Sunday. The new garden was funded by Farnham Town Council, the Village Hall Committee and Glendale Ltd.
Councillor David Attfield, Mayor of Farnham thanked everybody who had been involved in the project and rededication service. He said: “As we approach the centenary of the end of the First World War, it is a time to remember the bravery and dedication of all those who gave their lives fighting for their country. The dedication service included prayers, readings by children from All Hallows, Badshot Lea, Barfield School, Heath End and William Cobbett, and a blessing of the memorial. The service concluded with everybody singing the National Anthem.